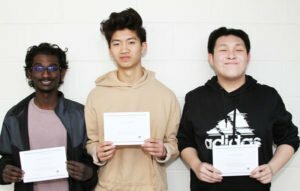 Four Hamilton High School seniors have been named finalists in the National Merit Scholarship Competition. The students are Alan Chen, Elyse Eckert, Matthew Gnanadass and Andrew Tai. High school students enter this competition by taking the Preliminary SAT (PSAT)/National Merit Scholarship qualifying test, which screens approximately 1.5 million entrants who are high school juniors.